Summer time brings the heat in more ways than one. Not only do you have the outrageous temperatures to contend with, but also the heat of every grill at every backyard barbecue you’re invited to. When the sweat’s dripping down your back and you’re constantly swiping at your forehead with a cool cloth, it can seem a bit overwhelming. That’s when a soothing drink poured into a tall cup of ice is just the ticket. It’s like manna from Heaven. Which is why I reach for an ice-cold glass of Dr Pepper at any summer event. Thirst officially quenched. I can breathe a sigh of relief, and successfully go mingle again. 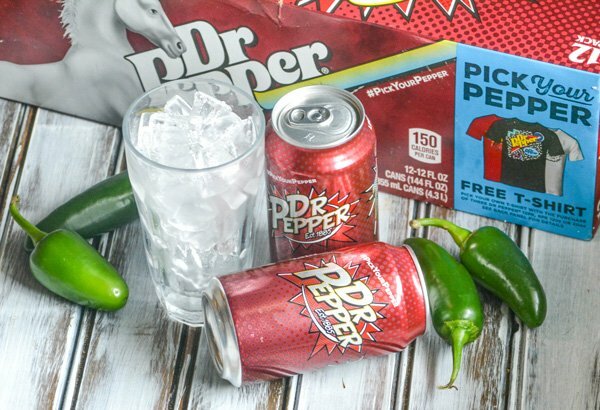 Did you know that right now, until August 15th (while supplies last) you can buy 3 Dr Pepper 12pk or 8pk 12oz (any variety) products at your local Kroger and get a free 20 oz? Tell me that’s not a deal! Or should I say steal?? Also, just in time for Summer they’ve come out with special, limited edition #PickYourPepper packaging. It’s a fresh new look, for a standard Summer staple. Look cool while you cool off. If you’re like us, you’re gonna want to snap a quick pic here and there to remember the good times at those summer barbecues. If you’re on Snapchat, snap a quick pic of the code on your bottle of Dr Pepper and you can get a custom filter. Fun times with friends, and a great way to have a good laugh with a good group. What do your barbecues tend to look like? For us, it always involves our friends coming over, bringing a bunch of meat, and slow smoking it for a real feast come supper time. Chicken, beef, bacon, even hot dogs. We can make anything for virtually any meal, even snacks. Dr Pepper is a great beverage to cool off with, but it’s an even better way to infuse your food with a bold burst of flavor, and even better for adding a little bit of spice into any event. One of our favorite treats to ever come out of our smoker, any time, any event? 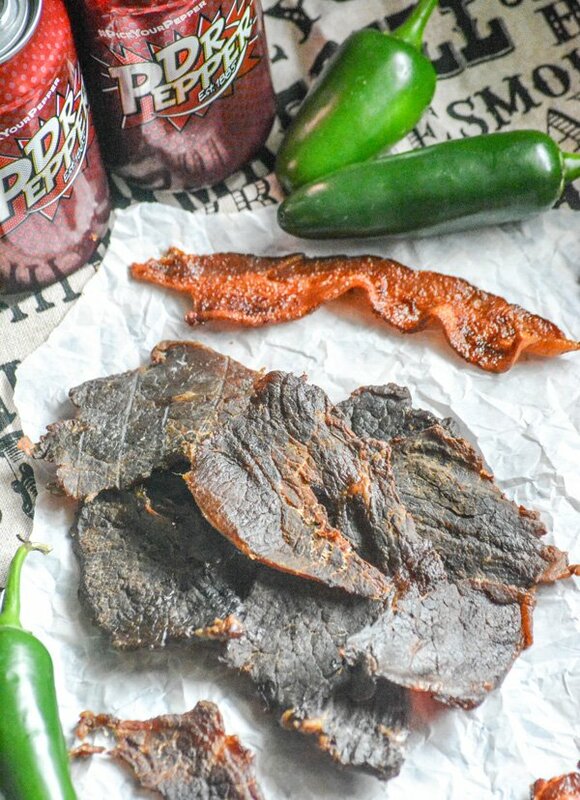 Dr Pepper Jalapeno Smoked Beef Jerky. 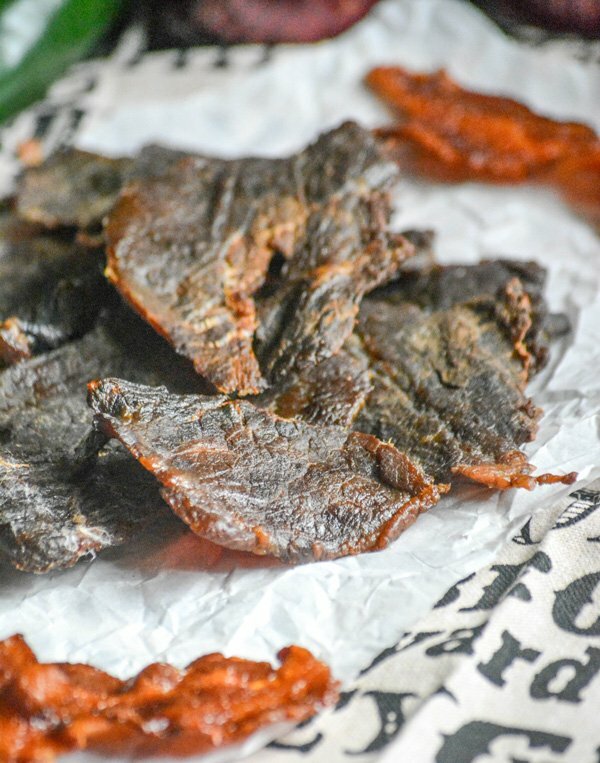 It’s slow smoked, and the perfect party favor. Thinly sliced eye of round roast, cold marinated with spicy Dr Pepper, Worcestershire sauce, sliced jalapeno peppers and a few other seasonings. It’s a bold treat that keeps on giving as the flavor eeks out of every chew. It’s good all by itself, and it will have all of your friends begging for an invite to your next backyard barbecue party. 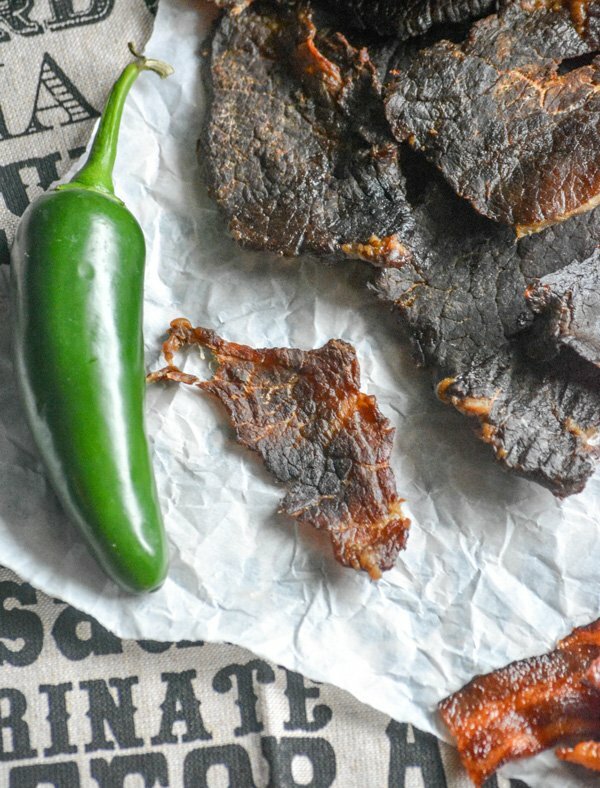 Shoot, they might even beg you to borrow your smoker– or just to make them a batch, because it’s that amazing. Just don’t forget to keep your pantry stocked. 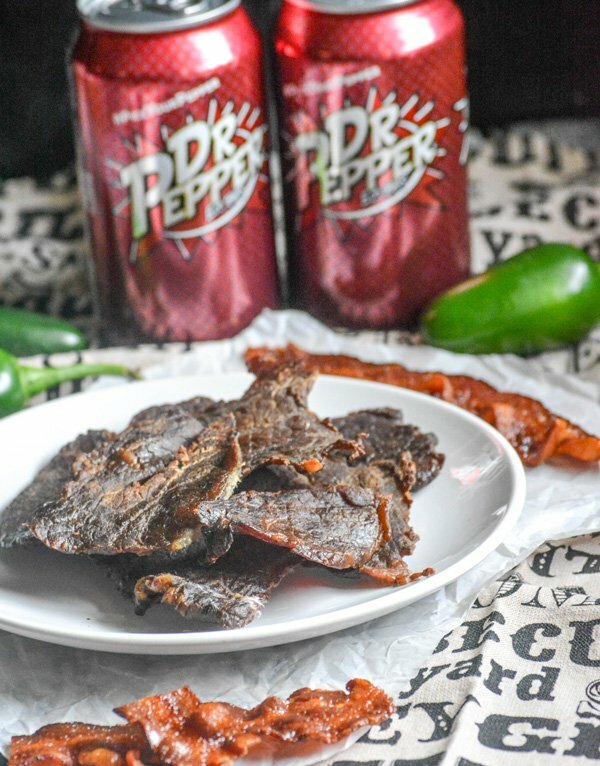 Head on over to Kroger and stock up on Dr Pepper, your jerky will be the life of the party and you’re guaranteed to rack up the barbecue invites. Strips of tender beef is marinaded in a bold, slightly spicy sauce before being slow smoked to chewy perfection. Add all of the marinade ingredients to a small pot on the stove. Stir together until the seasonings have been completely incorporated. Bring the sauce to a boil, reduce the heat, and let the mixture simmer for 10-15 minutes, stirring occasionally. Remove the pot from heat, cover, and let the marinade cool completely. Add the beef to a gallon sized zip-locking bag. Carefully pour in the marinade. Seal the bag completely, squeezing the air out as you go. Place the bag on a platter, and spread the meat out in the bag so it's flat and completely covered. Refrigerate for at least 8 hours, or up to overnight, flipping the bag several times so the meat soaks evenly. Preheat your smoker to 170 degrees, using a mixture of hickory and cherry wood chips. Pat each piece of beef between two paper towels to remove any marinade and dry completely before transferring the strips directly to the smoke racks or to cooling wracks to be set inside the smoker. Smoke the meat for 2-4 hours, checking every hour after the first one for done-ness. You want each piece dried evenly, firm but still pliable. 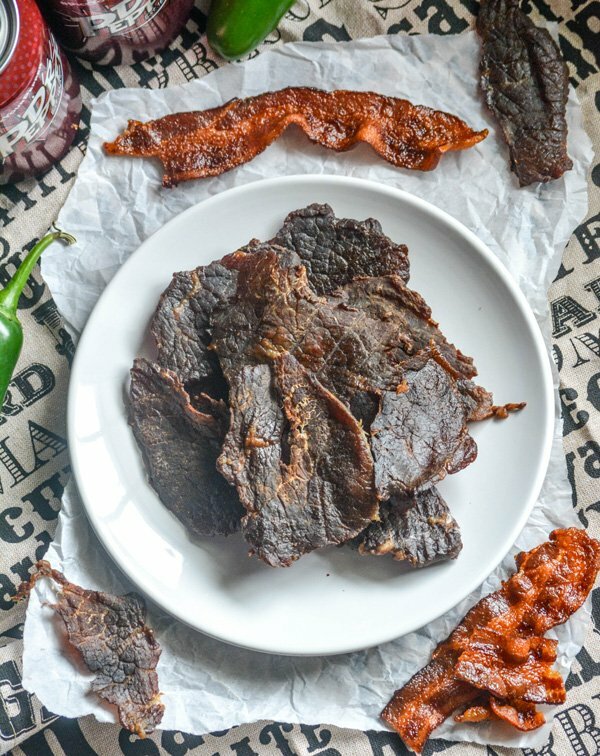 Remove the cooked jerky to a clean platter and loosely cover it with foil while it 'rests'. The steam will help it retain it's moisture. Enjoy your jerky. It makes a great high-protein snack, but don't be surprised if you have to make more than one batch because it gets eaten so quickly. 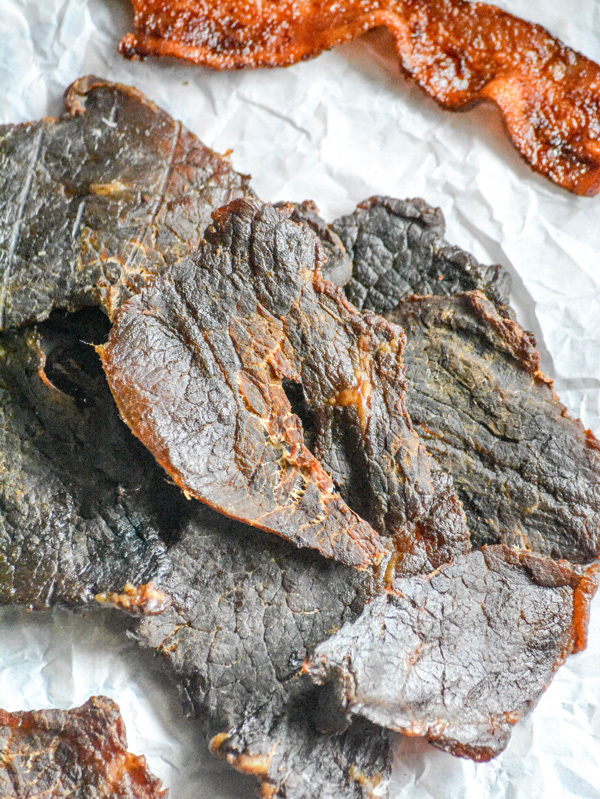 The jerky will last 4-5 days in a sealed tupperware on the counter, or up to two weeks when refrigerated. How would I do it with minced meat. That’s how I make my jerky is with minced. 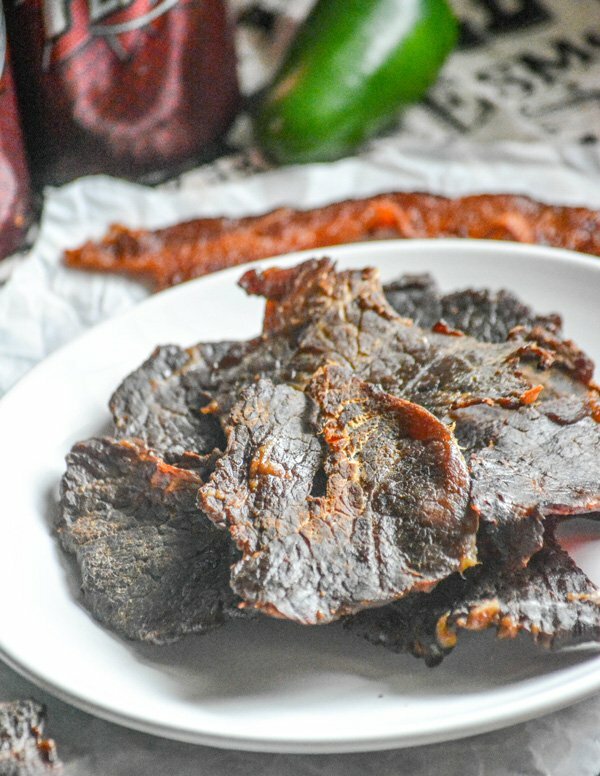 I’d marinate the ground beef the same as the sliced beef, then load it in a jerky gun and go from there.